I don't find the Republican candidates' proposals for huge tax cuts credible. @im.serious: Why don’t you think America is ready for a carbon tax? Just politics? Do you think a cap and trade program would be easier? Would it be the better option? 1) there's not yet a consensus that we have to do something soon about climate change; yes, it's politics 2) there's an aversion to any "tax" 3) cap/trade is a reasonable alternative, but less efficient. Better than nothing . @f.sjl: Can deficit reduction occur when Members are pledging to never raise revenue? Cutting waste alone will not reduce the deficit in any meaningful way. I doubt that Congress will ever be willing to restrain spending sufficiently to put the budget on a sustainable course without some revenue increases. @spendingtaxpayercash: Grover Norquist is holding a Cloakroom Q&A on Friday, and he will surely disagree with your assertion that we must raise revenues to put the budget on a sustainable course. What data do you use in rebuttal? 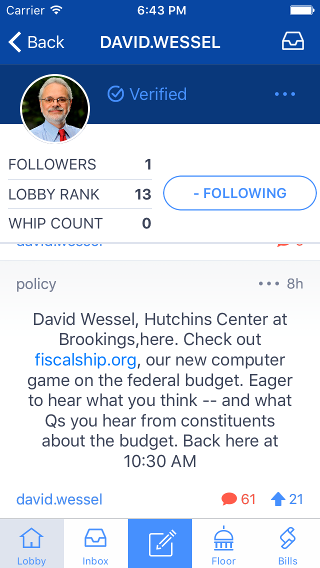 Play The Fiscal Ship and see what spending you'd have to cut to put the budget on a sustainable course and then ask if the American people and members of Congress would go along with cuts of that magnitude. @superstaff: Hi David, what do you think the single most wasteful item is in the federal budget? And how can we help to change that? That's hard. We'd all like to get rid of waste, fraud and abuse but there's no line item for that. We won't put the budget on a sustainable trajectory if we pretend we can do it by eliminating waste. That said, in a book I did on the budget (Red Ink, 2012), I picked on the National Dam Safety Project. @f.sjl: What is your opinion of a VAT tax? It seems like a tax that will just be more cumbersome to those that spend most of their income. A simple straightforward no-exemption VAT is regresssive, hurts those who spend all of their income. Yes. But there are ways to adjust a VAT or to couple with a (smaller) income tax to offset that effect. @sonofsam.ward: Hi David. How can regulatory structures keep pace with technology-driven financial innovation? How do you address regulatory and agency overlap? Also What's your take on finance being the way it is because of culture/"market color" vs actual structure & policy? In financial regulation, the biggest obstacle to reducing overlapping jurisdictions and too many rule-makers is Congress. The only reason Dodd-Frank didn't consolidate federal financial regulatory agencies (e.g. Merge SEC and CFTC) is because the committees of jurisdiction wouldn't go along. @jr.hebert: The 24 hour news cycle doesn't leave much room to make sacrifices today in order to achieve a more sustainable budget in the future. Is this the same dynamic we see in our inability to address climate? Is the 24-hour news cycle a cause or a symptom of the problem? Communications technology/social media is a tool. A wise leader could use it to pursue and sell policies that he/she thinks would serve the country well. @f.sjl: Humans are naturally self interested. We can rise above it occasionally but not consistently. Why do we expect politicians to be any different? Humans are self-interested, yes. Humans also are altruistic. Humans also care deeply about how well their children and grandchild will live: That's part of our evolutionary success. @david.wessel: Folks, I've got to go. Play www.fiscalship.org. And after you play the game, let us know what you think.